Home > Jeju MICE > Why Jeju? On the back of beautiful natural environment, the best meeting facilities, and various accommodations, Jeju is the best location for diverse international events and incentive travel. The 29th in the world, 6th in Asia and 2nd in Korea in the number of international meetings held. Jeju Special Self-Governing City and Jeju Convention & Visitors Bureau promise to provide full support from MICE infrastructure information and other information to touring after meetings to everyone who hold MICE in this beautiful island Jeju. Travel from east coast to west coast of the island takes 1.5 hours by car Diverse modes of transportation such as intra-city buses and inter-city buses, airport limousines, chartered buses, taxies, and rental cars make convenient travel possible. 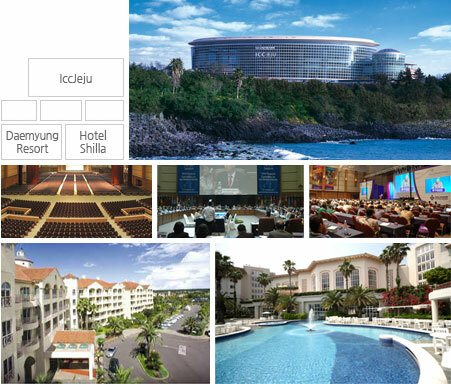 There are high quality and various MICE facilities from world-class convention facility ICC JEJU, top-notch hotels, condos, etc. There are hotels of many grades and rooms, and favorable discount rates in consideration of the budget of participants. A slew of tour programs are in offer based on beautiful natural landscape including UNESCO World Natural Heritage. Leisure and sporting activities can be experienced in some 30 golf courses, through scuba diving, paragliding, and fishing. JEJU Headquarters : 300-1, 3F, Yeon-dong, Jeju-si, Jeju Special Self-Governing Province, South Korea, 690-814, Yeha, Inc.
New address system (JEJU Headquarters) : 38, Yeonsam-ro, Jeju-si, Jeju Special Self-Governing Province, South Korea, 690-814, Yeha, Inc. Copyright ⓒ 2008 - 2019 YehaIMP All Rights Reserved.